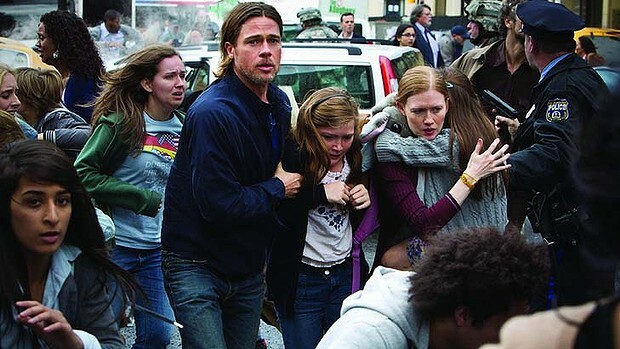 Gerry Lane (Brad Pitt) is a family man, with a wife (Mireille Enos) and two daughters (Abigail Hargrove and Sterling Jerins), who is thrown into an apocalypse where people are being turned into zombies. After he helps his family escape they are escorted onto the safety of a battleship. It is revealed that Gerry is a former U.N. investigator and he is told that his family can only stay onboard if he helps to uncover the secrets surrounding this global disaster. Gerry is forced to travel through numerous countries littered with zombies, including Israel and South Korea. Will he be able to find the cure and reunite with his family? If only the film gave you a single reason to care. Directed by Marc Forster (Quantum of Solace, Finding Neverland), this is a colossal disappointment for a movie that was once unlikely to ever see the light of day. 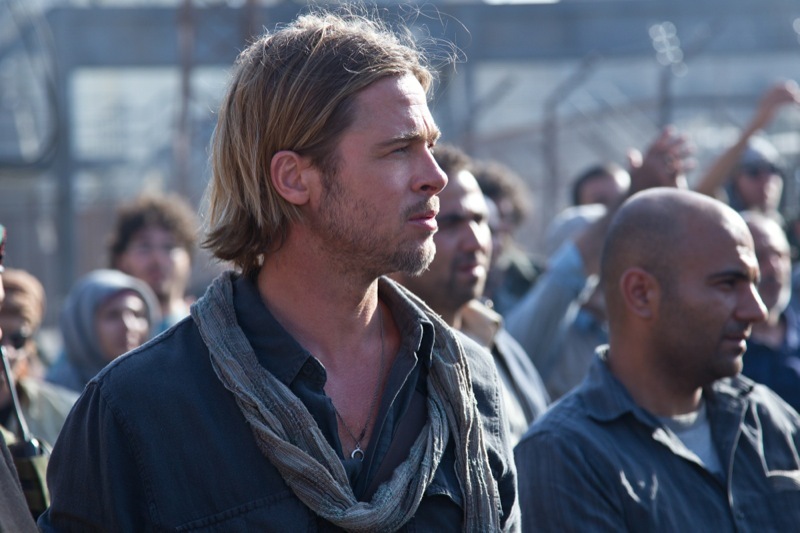 Brad Pitt is a producer on the film as he bought the film rights of Max Brooks' apocalyptic novel ahead of Leonardo DiCaprio. By the time it's over you'll wonder why he bothered. The film is rumoured to have had its budget ballooned out to nearly two-hundred million dollars, as well as speculation about rewrites of the ending and an ongoing feud between the film's main star and director. As you watch the film it's not hard to see many of these problems visible on the screen. To counter the budget blowout they've taken the easy option by diluting the film down into a derivative action movie. Brook's novel is a collection of faux U.N. reports, outlining the observations of a zombie apocalypse. The film has the very basic framework of the book in that its join the dots plot shifts Gerry from one continent to another. Yet there is so little time spent on establishing Gerry or his family that the movie is emotionally inert. For all of the holes in its science, Steven Spielberg's War of the Worlds is a comparable and superior film. It spent more time establishing the family dynamics and the characters so that the action was meaningful, tense and involving. The terrible reactions of the humans were a lot more interesting and damaging than the aliens themselves. 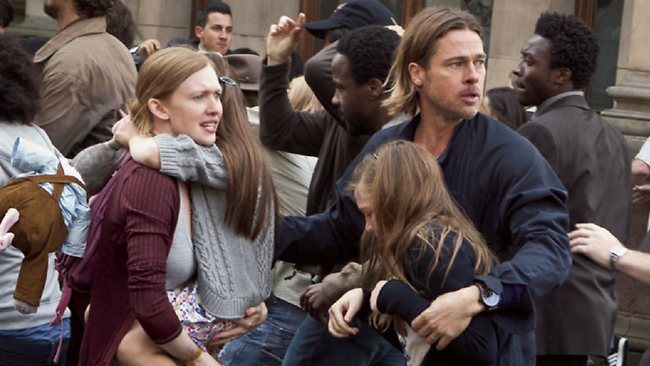 World War Z has scenes of looting and post-9/11 images too but when we know so little about the central character and Pitt's performance is uncharacteristically dull, it's extremely difficult to care. The film is also terribly impatient. After one family scene together it bolts straight into action scene from the trailer where the cars are blocked and attacked in the street. This is one of many setpieces used to substitute the humanity, characters and plotting. These big showy moments are all choreographed to the same rhythms and beats: Gerry enters a new country, the next stage of the plot is explained and then the zombies strike. As with Quantum, Forster believes that cutting as quickly as possible makes the film more intense. 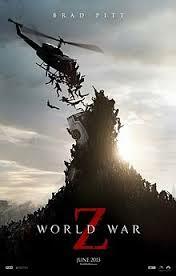 There are a few jumps but the film is murky, bloodless and at worst cartoonish. Where is the tension when Gerry can lob a grenade inside a plane, become impaled and still survive the subsequent crash-landing? The only interesting setpiece is towards the end of the film when Gerry starts using his surroundings more by relying on sound to avoid or call the zombies. If the film has any subtext at all, it is the cornball message of the world finding its savior of mankind, who is simultaneously the preserver of American family values, fighting against the unknown and the outsiders. Largely though, it's an expensive computer game still waiting to be made, and a hurried, overproduced film that should have impressed considering the hype, talent and money behind it.